Need to focus? Have a coffee break with this fun mug. 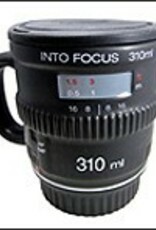 Each comes with a rubber "lens" lid to help keep drinks warm. Holds up to 10 ounces.